Yes, it was a productive week. Last week I told you about 2 projects that I was determined to finish. Each only had an hour or two of work required to finish up. I put my hands to the task and they are done. The first was a wall hanging. Its 29 3/4 inches square. I attended a year long series of applique classes and made a heart of each technique. They range from fused and stitched, to hand applique. Around each heart I inked in the technique employed. You can just notice it on the second picture of the ruched heart. It is hand quilted. I have attached a label and completed the documentation sheet and even photographed it. Now its waiting to February to move to hubby's office. The second project I finished last evening. 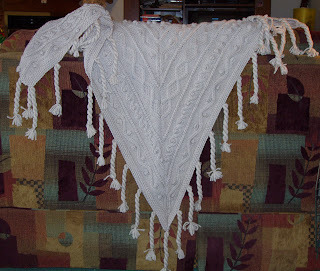 I needed to darn in some yarn ends and sew on the 31 tassels to the pictured shawl. I am so thrilled with how it turned out. It will be put to go use this winter that's for sure. I suspect that there are few other almost finished projects lingering around the house. I vow to finish them as I find them. I'll continue to post my results. The challenge to you is still open till next Monday. I wrote about it last Tuesday and few readers have commented that they are working on much larger projects that will take ages to finish. Post a comment if you have a project that has been sitting and it only requires and hour or two to finish. I am almost finished that green scarf that I showed you last week. Will have the pic for you next Tuesday. Over at 'Tropical Screamer' Darilyn has posted a pic of block C-4 from her version of 'Dear Jane' Quilt. She hand pieced this one. Congratulations on finishing two projects. Your shawl is so beautiful! Oh, your two projects are beautiful. each is so special. Thank you for the link and for sharing your terrific projects. I, too, only have big projects that'll take a very long time to finish. You do such beautiful work! Congrats on finishing. The pattern is by Mission Falls in their booklet "East + West"
I love that first piece of work, it reminds me of a stained glass window, beautiful work Heather. 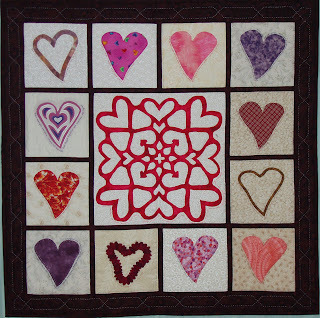 I love it that you linked up this STUNNINGLY GORGEOUS heart quilt to Guest Heart Thursday!!! It is PERFECT - and I LOVE it!!! 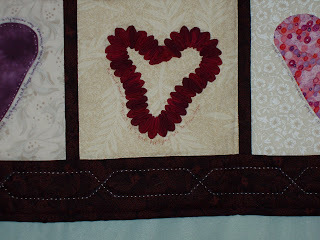 Your heart quilt is wonderful! Like all the textures in this work.